350 Commonwealth is located on the south side of Commonwealth, between Hereford and Massachusetts Avenue, with 348 Commonwealth to the east and 352 Commonwealth to the west. 350 Commonwealth was designed by Obed F. Smith, architect, and built in 1883-1884 by Vinal & Dodge, masons, for building contractor George Wheatland, Jr. for speculative sale. He is shown as the owner on the original building permit application, dated November 10, 1883. The house was originally numbered 348 Commonwealth until about 1889, when 328 Commonwealth was built and the houses to the west of it were renumbered. 350 Commonwealth was one of thirteen houses (336-360 Commonwealth) built for George Wheatland, Jr., by Warren D. Vinal and Charles A. Dodge on land owned by Charles Merriam and by Jacob Rogers. 336 Commonwealth was designed by George Avery, 338-340 Commonwealth were designed by Bradlee, Winslow, and Wetherell, and 342-360 Commonwealth were designed by Obed F. Smith. 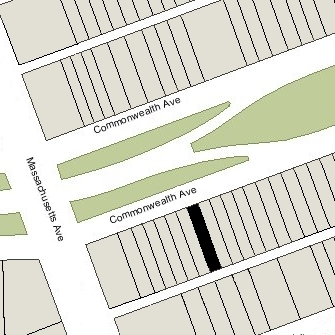 Click here for an index to the deeds for 350 Commonwealth, and click here for further information on the land on the south side of Commonwealth between Hereford and Massachusetts Avenue. On November 13, 1884, 350 Commonwealth was purchased from George Wheatland, Jr., by retired shipping merchant Arthur B. Gove. He and his wife, Margaret (Flood) Gove, made it their home. They previously had lived in Brookline. Margaret Gove died in March of 1888 and he moved soon thereafter to the Parker House hotel. On June 22, 1888, 350 Commonwealth was purchased from Arthur Gove by Louis Wolf, He was unmarried and lived at 350 Commonwealth with his mother, Barbara (Babette) (Edlinger) Wolf, the widow of Julius Wolf. Louis Wolf (and probably Barbara Wolf) previously had lived at 327 Columbus with Louis Wolf’s brother-in-law and sister, Nathan Baer and Rosa (Wolf) Baer. Nathan Baer was a jeweller. Louis Wolf was an importer and dealer in fancy goods, dolls, and toys. Barbara Wolf died in March of 1893. Louis Wolf continued to live at 350 Commonwealth, and in about 1895, was joined there by his nephew, Julius Irving Baer, the son of Nathan and Rosa (Wolf) Baer. Julius Baer was a clerk and later a partner in Louis Wolf’s importing business. Louis Wolf died in May of 1900. Julius Baer continued to live at 350 Commonwealth and operate the firm of L. Wolf & Co., and on July 15, 1902, he acquired 350 Commonwealth from Louis Wolf’s estate. Nathan and Rosa Baer had divorced and Rosa Baer had married again in January of 1896 to Charles H. Andrews, a former editor of the Boston Herald. He died in June of 1897. Prior to his death, they had lived at 401 Beacon. She married a third time, to George Edward Hale, a retired cigar store owner, and by the 1900-1901 winter season they were living at 350 Commonwealth with Julius Baer. At the same time as he acquired 350 Commonwealth, Julius Baer created a trust, with himself as trustee, under which his mother had the right to live at 350 Commonwealth for the rest of her life, or to lease or sell the property, in exchange for her paying the interest on any mortgages and all property taxes. George Hale died in March of 1911. Julius Baer and Rosa Hale continued to live at 350 Commonwealth. Rosa Hale died in June of 1915, and by 1916, Julius Baer was living at 76 Huntington. He continued to own 350 Commonwealth and also to maintained a residence in New York City. By 1917, he had married Irene Lee, and they were living at 350 Commonwealth when they applied for passports in May of 1917 to travel to Canada and Japan. On August 22, 1918, 350 Commonwealth was acquired from Julius Baer by real estate dealer John J. Johnston. Julius and Irene Baer subsequently moved to Denver because of his health. They divorced there in December of 1923, he married again in May of 1924 to his nurse, Elsie Bader, and he died in October of 1924. 350 Commonwealth was not listed in the 1917-1937 Blue Books. 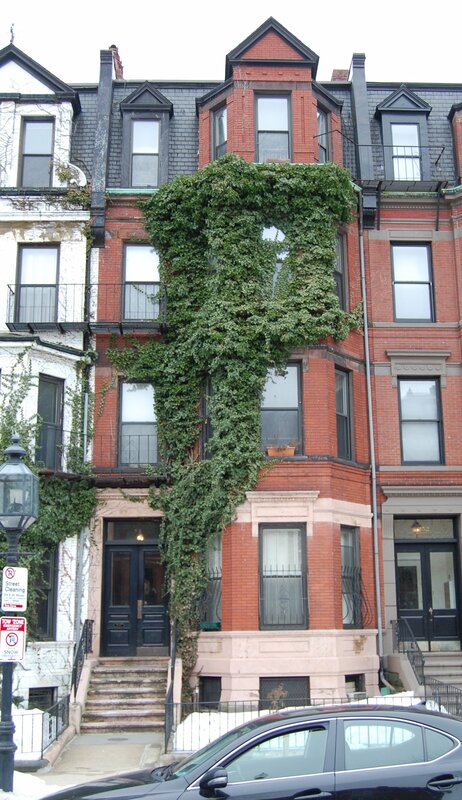 On February 26, 1919, 350 Commonwealth was acquired from John Johnston by real estate dealer George J. Wilson, and on April 7, 1919, it was acquired from him by Annie Jane (Trimble) Varney, the widow of John R. Varney, She lived at 139 Newbury, where she operated a lodging house, and probably also operated one at 350 Commonwealth. On July 21, 1920, 350 Commonwealth was acquired from Annie Varney by Mary Elizabeth (called Elizabeth) (Mitchell) Kellogg, the wife of Dr. Frederic Leroy Kellogg. He was a physician and also maintained his medical offices there. They had married in 1918 and then had lived at 366 Commonwealth, where he also had maintained his office. The Kelloggs converted 350 Commonwealth into offices and apartments. Frederic Kellogg died in May of 1939. After his death, Elizabeth Kellogg applied for a license to operate a lodging house for aged persons at 350 Commonwealth. In June of 1939, the Building Department advised her of the egress and change in occupancy requirements that had to be met before she could use the property for that purpose. She subsequently abandoned the application, but applied once again in 1945, and was once again informed of the requirements that needed to be met. She continued to live at 350 Commonwealth until about 1946. She had moved to 346 Commonwealth by 1947. On October 15, 1946, 350 Commonwealth was acquired from Elizabeth Kellogg by real estate dealer Edward Swartz. The property was shown as vacant in the 1947-1949 City Directories and was not listed in the 1947 and 1948 Lists of Residents. On February 17, 1948, 350 Commonwealth was acquired from Edward Swartz by Russell Dwelley Curry, who lived in one of the apartments. He previously had lived in Arlington. Russell Curry was owner and operator of the Curry School of Dance in Arlington, which taught dancing and etiquette. The school was founded by his mother, Grace (Dwelley) Curry, wife of Frederick Curry. In August of 1948, Russell Curry applied for permission to remodel the interior, indicating that the use was to be the “same as previous: offices and apartments.” He subsequently abandoned the permit, but based on City Directory entries, appears to have occupied the property as medical offices and apartments. In October of 1952, he filed for permission to change the use of the property, indicating that the current use was four medical offices on the 1st and 2nd floors, one apartment on the third floor, one apartment on the fourth floor, and one apartment in the basement. He proposed to convert to the property into two doctor’s offices (one each on the first and second floors, in the front) and four apartments (adding an apartment in the rear of the first and second floors). He subsequently abandoned the permit. On August 15, 1978, 350 Commonwealth was purchased from Russell Curry by Robert White. He already owned thirteen other houses on the block: 324–326–328–330–332–334–336 Commonwealth, 344 Commonwealth, 348 Commonwealth, and 354–356–358–360 Commonwealth. Later that same month, he acquired 322 Commonwealth, and in October of 1978, he purchased 346 Commonwealth. In December of 1988, he applied for (and subsequently received) permission to convert 350 Commonwealth from a single-family dwelling (the last legal occupancy on record with the Building Department) into nine apartments. At the same time, he also applied for (and subsequently received) permission to combine it with 344, 346, and 348 Commonwealth into one property, to be known as 344-350 Commonwealth. On May 5, 1989, he filed for (and subsequently received) to increase the occupancy of the four buildings from 17 to 35 apartments.